Apple’s new campus is rapidly taking shape. The personal electronics behemoth is building its new headquarters on the former HP and Compaq site in the northeast corner of Cupertino, California. 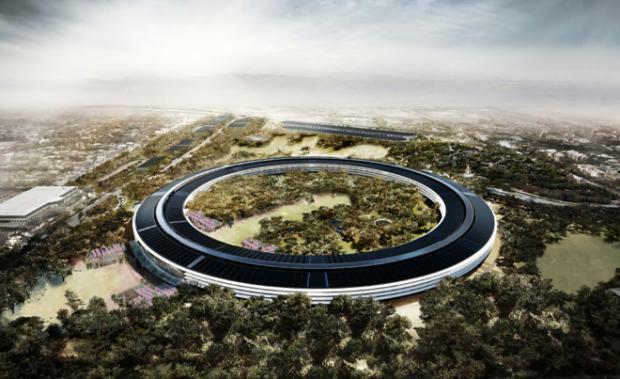 Appropriately dubbed The Spaceship, Apple’s new HQ will cover 2.8 million square feet. Designed by star architect Norman Foster it’s main building is a circular four-storey ring that will house over 13,000 engineers and designers under a single roof. Opening in 2016 the total cost is estimated to be a whopping $5 billion, which may seem an awful lot, but minor compared to the nearly US$200 billion in cash reserves that Apple is currently sitting on. (Microsoft has about $90 billion in cash reserves. )One Australian company is lucky to be considered as a key supplier during the construction phase – Gold Coast-based Skudo. Skudo is a specialist in construction coatings and are providing peelable protection for surfaces at the Apples campus during construction including on glass, polished concrete, terrazzo and marble. told Jenna Rathbone at Business News Australia about working with Apple. "We have been working behind the scenes on the Apple project for a number of years - it was one of the last design aspirations of Steve Jobs, who was heavily involved in it and canvassed it through Council to get the approvals," Bone said. Some of the landscape design which is being overseen by Apple's senior arborist. [/caption]Apple will be keeping its existing campus at One Infinite Loop, Cupertino. Employees arriving by bus will enter the Corporate Transit Center. [/caption]Some facts about the Apple spaceship:• The four storey structure will feature huge walls of glass (over 6 kilometres) that will allow those inside to look out from both sides of the ring. • The car park is totally underground and hence the campus won’t be spoilt by open air asphalt. • Norman Foster said that Steve Jobs asked to be part of the design team rather than being considered the client. • 7000 trees will be planted around the campus with Steve Jobs wishing the landscape to resemble the Californian landscapes from his childhood. • Building contractors Skanska and DPR were removed from the project in early 2015 and replaced by Rudolph and Sletten & Holder Construction. It is reported that Skanska lost about $800million in revenue as a result. • The $75 million fitness centre will cater to all the Apple employees in Silicon Valley. • The site will have 1000 bikes on hand for employees to get around the campus. • It will have a 1000-seat underground auditorium which will be used for future Apple events instead of them needing to be held in nearby San Francisco. Critics point to the extravagant cost especially from stock holders and those nearby feel that the campus is insular and not connecting enough with the local community.